Explaining why you love Lego is difficult; loving it isn’t. When I was a kid, I would build for hours, original inventions and standard sets, creating play worlds where anything could happen and in which hundreds of characters lived. Now my son is a big Lego fan, with a natural talent for building and puzzlework that rivals my own at that age; I think this master builder may have found his apprentice. See, even talking about Lego can immerse you in an imaginary land, it’s no wonder movies and books and shows have been born from this toy, with no signs of slowing down. First the Lego Movie, then Batman, now Ninjago, based on the hit Lego-themed show. My son knows everything there is to know about the ninjas, a lot of it has rubbed off on me, and I was happy to watch this silly movie. 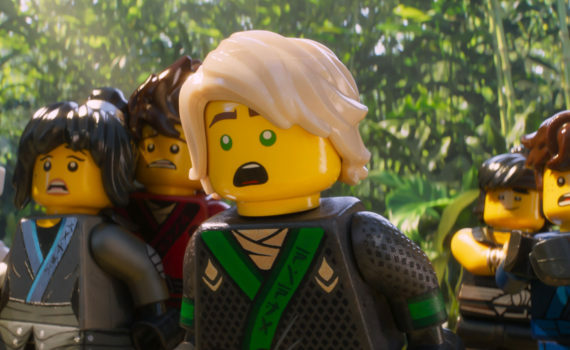 Lloyd Garmadon has it rough, being the son of the evil Lord Garmadon and having to watch his father attack Ninjago City over and over, always turned away by the famous Spinjitsu Ninjas. No one wants to be Lloyd’s friend, and no one knows that he’s actually the leader of the Ninja group, the Green Ninja, an important piece in every battle with Garmadon. Lloyd longs to tell the villain mastermind that he’s his son, but his identity is secret, and he can’t let the truth leak. But this nondisclosure is eating him up inside, and affecting his ability to lead his team. When Garmadon attacks with his secret weapon, Lloyd’s anger leads to his defeat, and the capture of Ninjago City. Now, he and the Ninjas will have to go on a journey to find the Ultimate Ultimate Weapon, the only thing that can take back their home and defeat their nemesis for good. Animate some Lego and I’ll be happy; it doesn’t take much. This movie franchise is a little goofy, directs itself at younger audiences, moves too wildly and without a clear direction, but is undeniably fun, especially for anyone who has loved Lego all their life. And it helps that I know the backstory from books and such, the stories of there characters, because the film is definitely aimed at those who have watched the show, not those just stepping in for the first time. A lot of the best jokes are in the trailer, so you’ll be hunting for more comical moments, but there is one giant addition that was never previewed, so that’s an enjoyable surprise. The whole thing is meant to be ridiculous and over the top, and the rest of the cast sure helps: Fred Armisen, Kumail Nanjiani, Michael Peña, Abbi Jacobson, Zach Woods. It’s a great team of comedians, the animation is super cool, and you won’t be disappointed if you’ve seen & been entertained by the other Lego movies, and especially if you’re already of fan of Ninjago. Watch with your kids for an amusing (if possibly forgettable) time.